My children would tell you that I hate Christmas music, which is not exactly true. It’s just that I’m married to one of those people who love Christmas music. And I mean ‘love” here in a slightly creepy, bordering-on-obsessive kind of way. You know that lady in your neighborhood growing up whom you heard had an entire room filled just with dolls? My husband collects Christmas music in much the same manner. He makes an exclusively Christmas music filled playlist – a different one – every December. We now have a house rule that no Christmas music plays until after Thanksgiving because he seriously used to break it out in September. Anyway, like I said, it’s not true that I hate all Christmas music, although I am quick to tire of cheesy shopping mall seasonal tunes. In fact, it’s been a wonderful part of my December to read these stories each day and remember songs that I love (and even to hear new ones). I think the reason that I can get grumpy about Christmas music is that, like much of the season, it feels like it’s trying to make me be happy, and I don’t care for that so much. Let me be clear: I love to be happy, but I don’t like to feel forced. I can’t live up to everything this season puts in front of me: list after list of things to do and gifts to buy. Besides that, Christmas always has a note of melancholy; it is a touch point for memories that are good and also ones that are hard. Most Decembers I am kind of a big mess. The first time I heard it I thought YES. That’s it! I do wish I had a river I could skate away on. And if there were any year that I would feel completely justified in wanting to skate away, it would be this one. It’s been harder than most. But this December I’m not going to skate away, even though some days I want to. This December, more and more, I’m understanding that God is in the right in middle of the mess with me. As a good friend recently said to me – when I look at Scripture, God is always showing up in the middle of the mess. I mean, just look at the audacity of Jesus showing up without even a place to be born. That is a mess! And it’s true, isn’t it? I’m not sure why it’s so hard for me to see that. But I am grateful for a song that reminds me that all is not okay right now, and that even the hard places can be beautiful. And I am grateful for a God who is with me, right in the middle of it all. Today’s story is by Sarabeth Jones, and we’ve linked to her favorite Christmas song below. 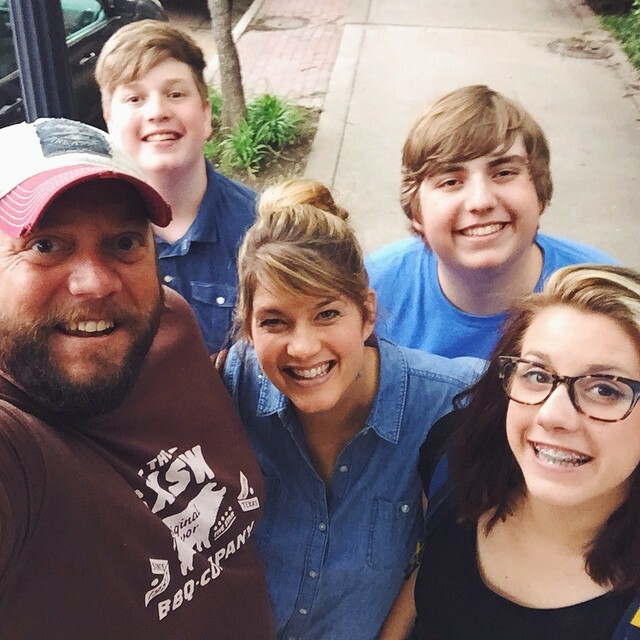 Sarabeth Jones works with all kinds of creative & communication elements at Fellowship North. She adores her Christmas music loving husband and their very funny kids. She’s adjusted to life with a giant dog, and may even have warm fuzzy feelings about it. Other favorites are all kinds of art, being next to the ocean, and living the Dogtown life.